Diagnosing autism spectrum disorders (ASDs) can be difficult, since there is no medical test, like a blood test, to diagnose the disorders. Doctors look at the child’s behaviour and development to make a diagnosis. If you think your child may have ASD and you want to get a diagnosis, the first person to approach is your GP (or in the case of young children, you can also approach your Public Health Nurse). When you go to see your GP or Public Health Nurse, you might like to take along a list of behaviours and characteristics that make you think your child has ASD. This can be a good prompt during your appointment, ensuring that you talk about all the things that concern you. Remember you know your child best and make sure your concerns are investigated. Child and Adolescent Mental Health Services for children (generally of ages 6 and older). In County Galway and Roscommon services for assessment and care of children with autism spectrum diagnosis is the Autistic Spectrum Disorder Team based in the Primary Care Unit in Athenry, County Galway. Or he/she may recommend you apply for Assessment of Need under the Disability Act. The process of diagnosis will vary depending on where you live. In some areas, multi-disciplinary teams carry out assessments. The teams are made up of several professionals including, for example, a clinical psychologist, a psychiatrist and a speech and language therapist. The professionals assess your child separately and their findings are then brought together by the team leader to inform the diagnosis. This may mean you need to go for several appointments some time apart. In other areas, you may only see one professional and it’s important that they have experience of diagnosing ASD. The people who assess your child may use a variety of diagnostic ‘tools’, checklists and observations in order to make their diagnosis. During the assessment(s), you should be given plenty of time to ask questions. Don’t be afraid to ask for explanations or clarification if you need them. Sometimes you’ll receive a diagnostic report (which is the formal diagnosis) at the end of your child’s assessment. At other times it is typed up and sent in the post. If this is the case, you might have to wait a while before the report arrives. Ideally, you’ll get a detailed report containing both the diagnostician’s findings and recommendations for support. It’s particularly important that your child’s diagnosis is clearly stated. Phrases such as ‘has autistic tendencies’, which are sometimes used, are not very helpful because they imply that a child does not have ASD. This can cause problems when trying to access ASD-specific support. Diagnostic reports can be difficult to read and understand in places. They may use language that diagnosticians are familiar with but that you might not be. You can call the diagnostician to talk through any parts of the reports that you aren’t clear about. If your child has an autism spectrum disorder (ASD), getting a diagnosis can be a positive thing. It means you have an explanation for some of the difficulties your child may be experiencing, and it also gives you access to services and support. In the area of disability services within the HSE are ungoing a lot of change at present so information may change and is for guideline purposes only. In general, children under age 6 being assessed for autism or have a diagnosis are looked after by the Early Intervention Services or Primary Community Care Services depending on their pathway of referral. 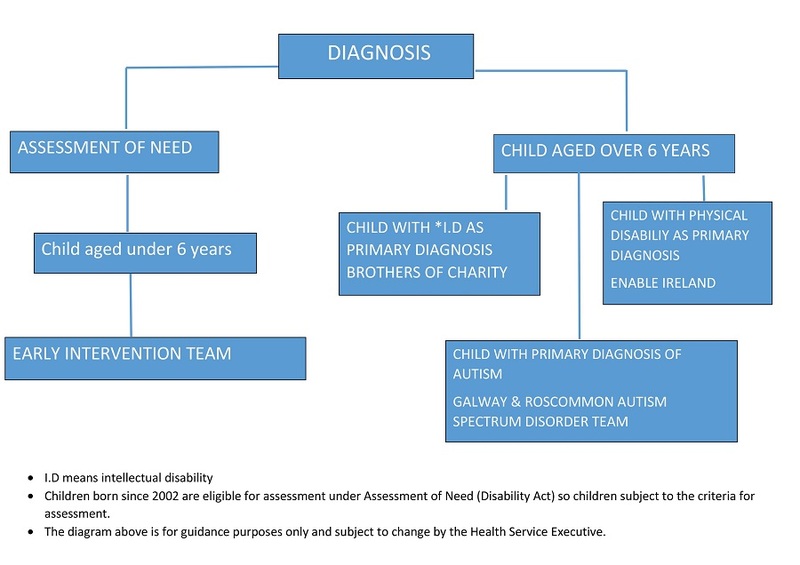 School age children who have a diagnosis of Autism, being referred on from Early Intervention services or awaiting assessment alone since January 2013 in the County Galway and Roscommon Area, are usually referred onwards to the Autism Spectrum Disorder Team based in the Primary Care Centre Athenry County Galway. Children with a diagnosis of Autism and a Physical Disability are usually referred onto Enable Ireland. Children with a diagnosis of Autism and an Intellectual Disability are usually referred onto the Brothers of Charity.